When Sirhan Khan comes to Washington D.C., things begin to explode - literally. Known only to the FBI as Mirage,Khan sets about making a reputation for himself as a vicious and prolific terrorist, killing and destroying civilian, police and military targets with no regard for life. But as his remarkably brutal campaign kills countless innocent people across Washington City and its surrounds, it quickly becomes apparent that there is a common theme to most of the attacks - theft. Almost all targets include not only a terrible loss of life, but great loss of cash and valuables. Special Agents Kelly and Marshal are given the daunting task of stopping further attacks, but are powerless to halt Khan's team of murderers. Their only link with the terrorist-thieves is a reporter named Suzie Anderson, who becomes a pawn in Mirage's game. But what is Mirage's real motive? What is his ultimate goal? This novel is loaded with graphic murder, explosive action and new, creative ideas on the theme of terrorism in the modern age. Even the government has its awful secrets in this breathtaking offering. Guaranteed shocks! Guaranteed action and excitement! Known only to the FBI as Mirage, Khan sets about making a reputation for himself as a vicious and prolific terrorist, killing and destroying civilian, police and military targets without mercy or fear. On his first day alone, he detonates three bombs, killing many people and destroying a well-known landmark. Special Agents Roy Kelly and Donna Marshal are given the daunting task of stopping further attacks, and hunting down Mirage and his ruthless, pitiless band of murderers. But the agents quickly find that they are powerless to halt Khan's team, or the trail of death and destruction they leave. Their only link with the perpetrators is a reporter named Suzie Anderson, who becomes a pawn in Mirage's cruel, bloodthirsty game. Suzie and her news-team are forced to witness and report on many of Mirage's horrific deeds, including mass murder of police, destruction of landmarks, and ruthless, horrific mayhem. But as a remarkably brutal terror-campaign kills many innocent people across Washington and its surrounds, it quickly becomes apparent that there is a common theme to most of the attacks. Almost all targets include not only a great loss of life, but a great loss of cash and valuables. The hunt changes, and the quest becomes a mind-game to guess the next target. In his efforts to achieve his ultimate goal, Khan (Mirage) must enlist the help of Italian crime figures, the Sprizzis. And while Lenny and Danny Sprizzi have their misgivings about Khan and his ruthless band, the rewards for joining Mirage far outweigh their doubts. Together the two bands of killers wreak cruel and heartless vengeance on the legal system, the authorities, and all who would oppose them. The trail of death and murder seems to know no boundaries, and no end. But what is Mirage's real motive? What is his ultimate goal? This novel is loaded with graphic murder, explosive action and new, creative ideas on the theme of terrorism in the modern age. Even the government has its awful secrets in this violent and breathtaking offering. Guaranteed shocks! Guaranteed action and excitement! As always, there are clues along the way. And so the challenge for you is to find them, and to guess the real goals of these cold-blooded killers and thieves. The Penthouse is packed with bloody murder, cruel killers, and violent, explosive action. It's also a novel for those who enjoy dry wit and a hint of romance. This is my longest novel by far to date, and I can promise you, it is loaded from beginning to end with amazing insights and captivating action. Please, if you do anything this year, don't miss this! There is no particular Christian or moral message in The Penthouse. When I wrote it, I was just speculating on what might be possible, and to what lengths a government might be prepared to go to... and I was just having a bit of fun. It is one of my earlier novels, and anything it lacks in polish, it makes up for in thrills and insights. "I see the bus. My cameraman has it." "Good girl," came the warm reply... "We'll talk again very soon, Suzie... You take care..."
She... was about to ask him to repeat what he had said, when the world at the end of the block erupted into a massive fireball. She knew nothing of the explosion except for an awareness of percussion. She saw no shredded metal... and she saw and felt no flames. Her young face was torn completely off as the first shards ripped through... dicing all those on board and tearing their bodies apart. The pulverized matter that made up their bodies... sprayed across the street... amid the debris... vomiting human matter across the passing movement of morning traffic. As ??? turned to enter the small cubicle... Andrea Anger stepped silently up to her prey, bringing the tip of the silencer to the back of the guard's head until it mingled with her hair. A single popping sound emanated with the excited squeeze of a trigger-finger, and Andrea saw a bright red flower blossom instantly on the wall ahead of her victim. "Get going, and don't look back. Go!" Still crying, the girl... turned to run... As the girl continued to trot, stumbling with terror... Andrea took aim and shot her just above the center of her back, and then in the back of the head... The girl fell and sprawled... Andrea held the tip of the silencer vertically before her mouth, then blew away a wisp of smoke. "Just like the old west," she said aloud... "This is fun!" The police car struck with devastating force, its driver and passenger already dead... The aimless, howling metal coffin plowed deep into its fellow cruiser, burying itself so far that the two became one. ??? was pulverized... killed in an instant. ... as the hulking cloud of debris rose into life, a huge, dull thumping percussion that seemed to last for over a second impacted... a shockwave that shook all those present. It also shook the entire nation. "I don't want to shoot her," ??? explained, a wild, mischievous expression blossoming... "Teach me how to break her neck..."
"Please..." she begged, her weak hands barely able to rise to the battle. "I'm a human being... Please..."
Andrea leaned close... "No you're not. Not any more," she said cruelly. She blew the smoke from her silencer and changed clips. "Come now, Sirhan," she grinned. "You now I just don't feel right for the rest of the day unless I've killed someone..."
??? was not sparing with his ammunition, happy in the knowledge that there was ample for all... He punched away at the defiant cop's chest, relishing the heavy recoil of the assault rifle as the cop's white blouse became dotted with red splotches. It took another three full seconds before ??? realized that her partner had given up the race to catch the killers because most of his brain was now situated throughout the rear of the car. She had little doubt that she was about to meet Mirage in person. And after that, God. ??? saw his eyes flick, clearly a signal... With speed and grace, Sylvia... spun ??? on the spot... as she did so, there came a small metallic clicking sound from the German's right hand. Before ??? could register what was happening, the blonde assassin slipped her muscular arm before her prey, then back, the stroke little more than a blur. ??? 's throat was slit centrally and laterally, wide and so quickly that the girl didn't even know she had been murdered. ...he moved his right arm across in front of her chest, pulling it up tight as if he might choke her while his left hand went quickly to the side of her head. ??? gasped, shocked... and barely able to breathe... Then, with considerable strength, and deft, experienced hands, ??? simply snapped her neck. ??? gave a small grunt as the crisp sounds of breaking bones told of a cruel job expertly completed. She dropped her cellphone immediately and sagged in the chair. "Watch him," warned ???. "He has a knife thingy up his sleeve... killed the girl with it." ??? smiled when he thought of it. "Stuck it right in the back of her head. It was cool... real cool." "Oh, that's just plain cold," he mocked. Then he laughed... "All our... friends are dead. That was a good plan..."
"And now they will pay!" he bellowed. He felt his head swim, both from blood loss and from the dizzying heights of monumental success. "I hope you're ready for this, Agent Kelly... but I somehow think you won't be." Then he pushed the button. Broadcast live and later played back innumerable times, frame-by-frame for added effect, ...viewers were actually able to see the woman's face turn bright red as her blonde hair burned off in a moment, her death recorded forever by the miracle of technology. Red, then white, then so bright that it hurt the eyes... ??? 's body... incinerated in a blinding flash that removed all trace of... existence. 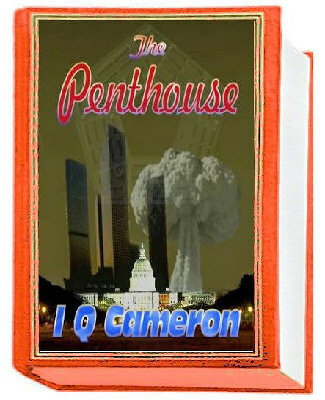 Purchase the disturbing conclusion to The Penthouse.